Nickel stainless steel with mirror finish. Flat and spoon ends. 9” (229 mm) overall length. 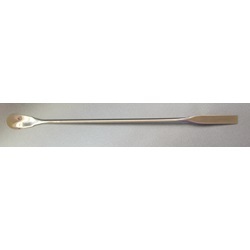 Spoon end is 1 1/8” (29 mm) long x 9/16” (14 mm) wide. Flat end is 1 7/8” long (48 mm).